The ORiNOCO 11b/g PC Card gives you the flexibility to connect to any 802.11b or 802.11g wireless network. 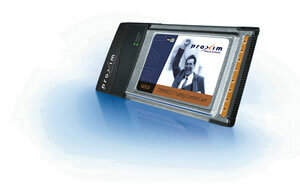 Just plug the 11b/g PC Card into the Cardbus slot of your notebook computer and you have everything you need for maximum wireless productivity in an enterprise, public building or at home. The 11b/g PC Card is part of ORiNOCO's family of client and infrastructure products - everything you need to work anytime, anywhere and the way you want.